One of the more famous Korean War battles occurred at Obong-Ni, and resulted in a major encounter between the NKPA's T-34 and USMC M-26 Pershing. The North Korean People’s Army (NKPA) had almost everything going its way during the earliest Korean War battles. The opposing South Korean and American forces, weak and unprepared, were pushed into a shrinking perimeter around the small port city of Pusan. That perimeter was steadily being reinforced, with an eye toward an eventual breakout and counteroffensive. 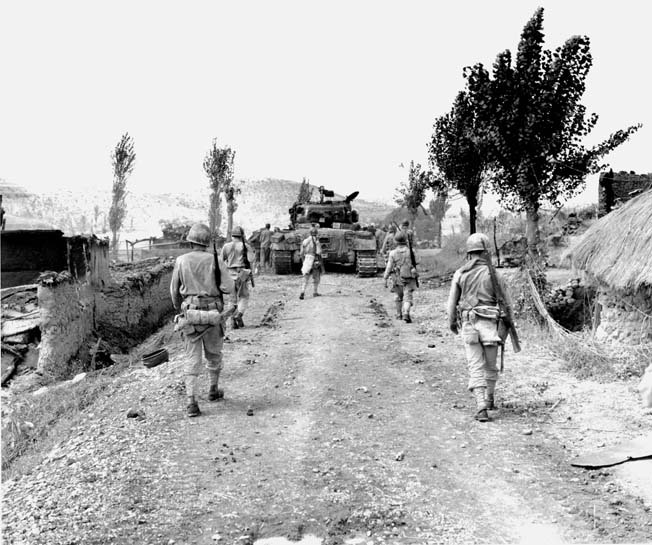 One of the units sent into the Pusan perimeter was the 1st Marine Provisional Brigade, an ad hoc unit formed to get a force into the fight quickly while the 1st Marine Division properly formed up. The brigade included a small force of M-26 Pershing tanks for support. These tanks were hurriedly readied for service to provide a counter to the NKPA’s Soviet-Supplied T-34 tanks, which had so far ranged almost unopposed against the light tanks and anti-tank weapons available to their opponents. The two tanks had never met in combat before, but it was hoped the M-26’s 90mm gun and thick armor would prove a match for the Soviet vehicle. NKPA pressure on the Pusan Perimeter weakened as American strength increased. By mid-August they were ready to throw the North Koreans back. The 5th Marines were assigned to take Obong-Ni ridge, known to the Marines as “No-Name Ridge.” Supporting them were four M-26s of the 1st Platoon, Company A of the 1st Marine Tank Battalion. The platoon was led by Lieutenant Granville Sweet. The NKPA 4th Infantry Division opposed the Marines with a battalion of the 109th Tank Regiment assisting them in turn. The day’s fighting ended, and the Americans set up defenses for the night. The tanks pulled back to refuel, but at 8 PM, they received the message code “Flash Purple,” indicating an impending tank attack. Lt. Sweet ordered his tanks forward as each finished topping off. He selected a narrow spot in the road and placed three of his tanks side by side, so if the enemy destroyed his vehicles, their wrecks would block the defile and stop the enemy advance. His tank had a problem with its elevation mechanism, so it stayed back. The defile was near a curve in the road, and the advancing enemy armor would be well within range before they spotted the Pershings. Down the road four T-34-85s moved closer, going past American infantry, threatening to cut the lines between two different units. American troops fired at the tanks with recoilless rifles and bazookas. The tank’s external fuel tanks were set ablaze, but none were knocked out. They kept ahead, up to and around a curve in the road. As the four scorched tanks turned the corner they came in sight of the M-26s. The stage was set for the first tank battle between the Marines and NKPA. Technical Sergeant Cecil Fullerton’s tank A34 fired first, firing High-Velocity-Armor-Piercing (HVAP) rounds, one after another. Fullerton complained to his gunner, Sgt. Stanley Tarnowski, that he’d missed his target. Tarnowski, however, was one of the best shots in the company; he hadn’t missed. All three rounds had passed completely through the T-34. One had struck near the Korean tank’s hull machine gun, killing the gunner and injuring the loader before passing through the rear armor. Marines on a nearby hill thought they were being fired at when the three rounds impacted nearby. The tank soon stopped. The second T-34 tank moved around the first and was immediately hit by several rounds, including one in the turret, causing it to slew around, firing its cannon uselessly into the side of the hill. The third T-34 began firing back at the Pershings from behind the wrecks of its two brothers. The Marines returned fire, hitting it seven times. Three of the crew jumped out and ran off into the growing darkness, but small arms fire from nearby did them in. The last T-34, commanded by the NKPA battalion commander, retreated back down the road but was soon knocked out by a US Army bazooka team. The M-26 crews continued to fire into the T-34s to set them afire, until Lt. Sweet ordered them to stop. During the fight the Marine tanks caught on fire—several times in fact. In their haste to get into action, the crews had spilled gas on the tank’s decks. The muzzle blast of their 90mm guns set the loose fuel aflame, and then the next would blow the fire out, only to have yet another reignite it. The watching infantry were given a strange display indeed. The tank battle was over and any doubt of the Pershing’s effectiveness was dispelled. The T-34s armor had proved no match for the American 90mm cannon. The M-26s and their crews were up to the challenge and the T-34’s aura of invincibility was forever broken. Future engagements only showed the American tank, properly handled, was superior. Tags 90mm cannon, battle tank, Korean War, M-26, M-26 Pershing, Obong-Ni, T-34, T-34 tank.